Last year while strolling through the Portland airport a familiar face got my eye. It was an old friend of mine from thirty years ago, I hadn’t seen Randy since the late eighties. We both thought we still looked pretty good for couple of guys in our late 50’s. Yeah, our hair was gray, and we were both a little thicker. But we eased back into our conversations of what we had been up to all these years. We laughed about all the fun time we shared together back in our 20s. He was headed back to Spokane and me to California. We both agreed to try to meet up if I got back to Spokane in the summer. A quick handshake and a hug and we both went our separate ways. A moment in time opened up and it closed just as quickly. I never made made back to Spokane. It came in a text message from another old friend that Randy had died following a surgery. A smile and a beer in his hand is how I’ll always remember him. Bye Randy. The auctions are heating up. We’re having a crazy winter here in the Pacific Northwest with snow and freezing temps every other day. I’m looking forward to some warmer weather as spring approaches. While it may be cold outside, the first group of our fundraisers in 2019 have been especially strong. The new trend has been to reduce the number of auction items. Back in the good old days, it was common to have 40-60 packages in the live auction. In 2019 it seems 10-20 items or even less seems to be the sweet spot. The audiences seem to appreciate an auction which lasts about an hour. Everyone in the room is raising their bid cards trying to chase those fewer items, and prices on the most desirable packages are bringing a premium. Remember, supporting your favorite nonprofit or school does make a difference. If you can’t donate time throw some cash their way it all helps. 2019 is starting off with a Bang! Tonight we start our fundraising season for 2019. It’s my first Monday evening auction we’ll see how it goes, I think we’re going to crush it! Along with our new fundraising clients in 2019 we will be going forward with a couple new partners, stay tuned for our formal announcement later in the month. 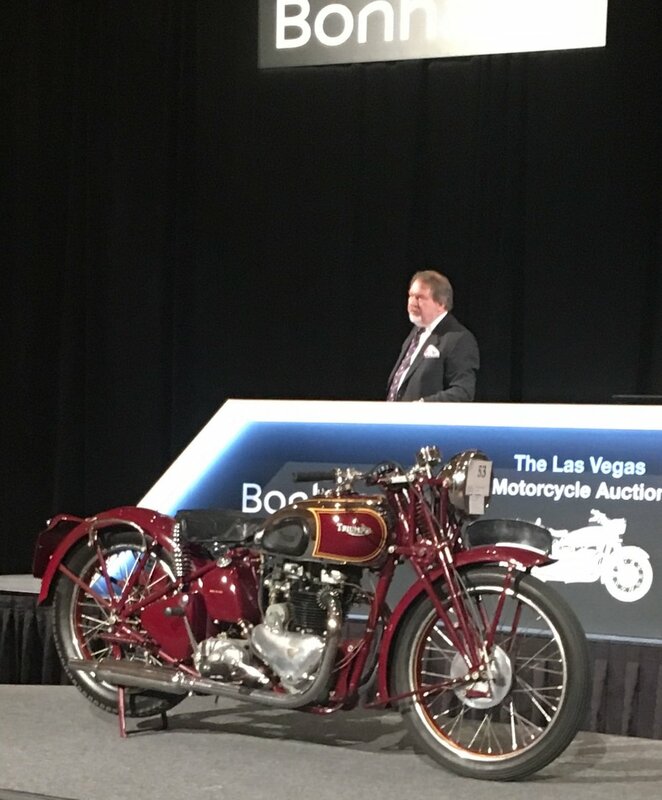 I had a Thursday off and went to Las Vegas for the Bonhams motorcycle auction this year. Prices were up on all makes and models of bikes. Interest in vintage motorcycles is strong right now not just here in USA but worldwide. I’ve included a couple of my favorites. 2019 is going to be an exciting year for us and we look forward to meeting you at our next event. Holy grail of motorcycles the Vincent’s. The King of Cool, Steve McQueen’s Triumph sold for $175,000. This past weekend I joined a gathering of Porsche enthusiasts known as P.O.G or the Porsche Outlaw Group. I had heard, through social media Magnus Walker would be in appearance at the event. If you don’t know who Magnus is, he was the star of a documentary film titled Urban Outlaw, it featured his personal collection of Porsches and beautiful scenes of him blasting throughout downtown Los Angeles and the surrounding hills in his vintage 911. The film touched perfectly on the emotional connections of of us who’ve ever owned or driven a Porsche, especially the early 911’s. I headed down to the OMSI parking lot on my old GPZ to check it out. It was a perfect November morning. Meaning it wasn't raining! Lots of cool cars showed up for the event. There was an excellent representation of new, vintage and modified Porsches on display. A couple days later a friend noticed a picture a photographer had taken at the show on his Instagram feed. Guess who made it into the shot? It was perfectly timed. After I saw the photograph it got me thinking about timing. Like being in the right place at the right time. When I look back on where I am today, a lot of it was just timing and luck. Just like the picture. Did it feel like the summer just blew by? It did to me! I spent Labor day weekend at the Portland Grand Prix. The Indycars returned back to Portland after their last race here in 2007. It was estimated that 40,000 race fans showed up Sunday afternoon for the big race. Having always been a Indycar fan, I opted for spending a little more money and got the pit pass too. I think being in the pits is almost more interesting than the race. You get a chance to watch mechcanics put their final touches on the car before the start of the race. The best part is hearing the cars being warmed up, and they sound awesome too. My first trip to the race was in 1984, and in those days its was three-day-party! We would ride our motorcycles down from Spokane, and meet up with my friends parents who would drive their motorhome down from eastern Washington. Fun times. Looking forward to next years race. Work and travel never keep me from clocking more miles on my old GPZ. I jump on my bike as often as I can. A spare minute always means another mile. I have already managed to get a couple of really good rides in this summer. Last month; I made the trip back to my hometown of Spokane to help out my old friend, Jay with his annual car show in neighboring Rosalia. He had invited me back again to be one of the judges for his annual car show. It’s a tough job when there are so many great cars! Besides the old cars, I got to visit and chat with some of my old college friends who also made the trip to Rosalia for the day. My old 1983 GPZ ran like a top for the 800-mile round-trip. Even more surprising was how well I held up on the ride! When I rode the exact route last year, the 90-degree heat took it out of me. The much cooler temperature this year made for a much more comfortable ride. This weekend, I did a couple of my favorite rides. First one had my heading east out of Portland onto Highway 84 towards The Dalles. From there I rode south on the 197 to Tygh Valley, then east onto Highway 216, which took me along the Deschutes River and up Shears Bridge Canyon. It’s a great twisty ride but you have to be careful because not all of the corners have guardrails. If you go off the road, it’s a hell of a long ways down to the bottom of the canyon! I continued on by connecting through Grass Valley onto Highway 97, then hooking onto Highway 84 westbound back to Portland. It’s a great 300-mile ride that I would highly recommend. The next day, I took a quick spin to Mount Hood with a quick visit to Timberline Lodge. The road around the backside of the mountain takes you through the wineries and fruit tree farms of Hood River. It really was a perfect weekend of riding. Did I do the speed limit? Work and travel have kept me busy for the past couple of months, but the past week really was the cherry-topper! So what have I been up to? I just returned from a five-day trip from the Okanagan Valley of British Columbia. 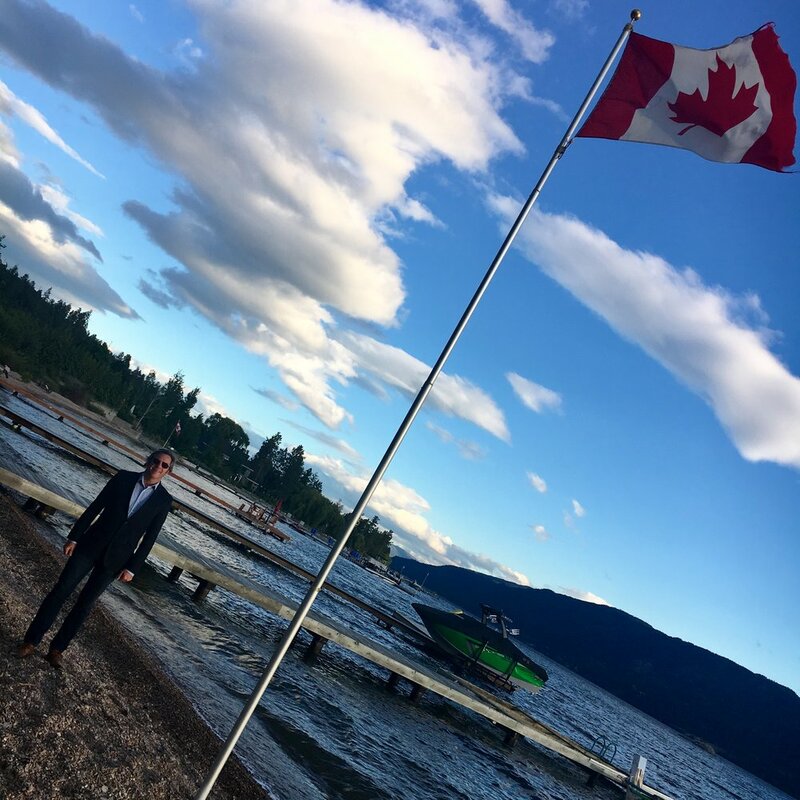 We went up for a wedding that took place right on Lake Okanagan in Lake Country. The next day, I was there to celebrate Canada Day too. Canada Day is July 1, so it was a super long weekend celebration that moved right into the Fourth of July. The Okanagan really is an amazing place. It is the heart of BC's wine and fruit industry. It is lake and cottage country. Most of BC’s wineries and orchards surround Lake Okanagan, a spectacular 82-mile long lake. Canadians take great pride in protecting their environment. The small towns we drove through dotted along the lake were pristine. Free of trash and graffiti, with main streets featuring well-kept storefronts, cafés, and long-time businesses. It was really refreshing to see and I am already ready and looking forward to going back for another restful vacation! Remember the call I got two months ago? I said yes to a fundraising auction that was to take place in a local Portland taproom. I got the call when the original auctioneer had backed out because she did not like the group's final selection of venue. Well, it turned out really well! It actually turned out better than any one of us could have imagined. We ended up raising nearly double the net proceeds that they had in years past. They were so pleased with the results that they rebooked us right away for their next year's event. I'm sure glad we said yes. It was a great group and a fun auction to work and we're looking forward to doing it all again next year. It just goes to show that success can be found anywhere and everywhere, as long as you open your mind and eyes to the possibilities. Thirty years ago, I started my career in the auction business. It was the evening of May 20, 1988 in my hometown of Spokane. It's easy for me to remember because it was my 27th birthday. 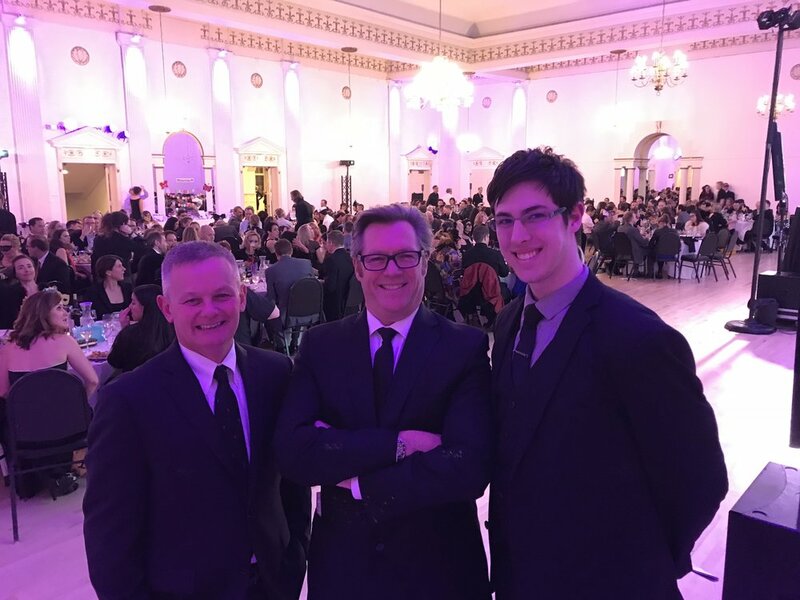 I was helping out my future employer, Mitch and his buddy Stuart at a fundraising event. Before that; I had never even attended an auction, let alone worked at an auction! My job that night was to simply help spot anyone's hand that shot up in the air, then let out a "Yep!" loud enough for the auctioneer to hear. It was a lot harder than it looked. Now turn the clock ahead thirty years and I have been the auctioneer of over 400 fundraising auctions. Who would have ever imagined what that one evening would lead to? This unexpected and rewarding career is what came of that night and I feel so lucky to be a part of it after all these years. Why do auctioneers talk like that? The Colonel auctioneering for The Colonel! I got a call the other day from an auction chair asking if I was available to work an auction on short notice. The original auctioneer that had been hired ended up refusing to work in the space that was selected for the fundraiser. In my entire time as an auctioneer, I had never heard that before! While some venues may not be the ideal space for live auction, this one seemed completely workable to me. I have always believed that any space can work as long as there are these two things - a place that guests can gather and a sound good system with which the emcee and auctioneer can work. So I got to thinking about all the places where I have worked as an auctioneer - hotels, schools, country clubs, golf courses, fairgrounds, basements, garages, parking lots, junkyards, airplane hangers, kitchens, sound stages, radio stations, galleries, courthouse steps, under the shade of a tree, a bowling alley. I have even worked in some unusual and harsh conditions; like in a rainstorm, a snowstorm, a thunderstorm in the Tetons. Any kind of auctioneer can make any auction work anywhere! All of my Saturday nights through the spring and fall are filled with fundraising auctions. This last week though, our team had back-to-back-to-back auctions Thursday, Friday, and Saturday evenings! I am glad to report that we managed to meet or exceed the goals at each and every event and surpassed the expectations of all those who were involved. It really is satisfying for me when my clients feel that we knocked an event out of the ballpark. It is especially rewarding when they are loyal clients whom I have had the pleasure of working with the longest in my auctioneering career. In today’s fundraising world, if the same auctioneer is invited back for three or more years in a row; that is considered a long stretch. So, I consider myself supremely lucky to have working relationships of upwards of ten years with some of my schools and non-profits. I still have a few full weeks ahead, so see you at the next auction! 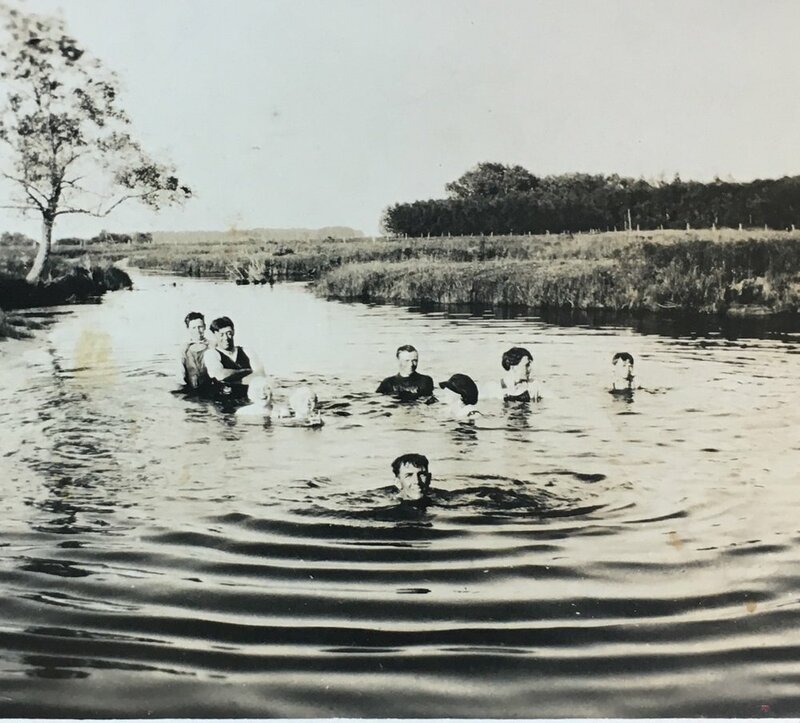 My grandfather enjoying a swim with his cousins. I remember when I was a kid in school, all through elementary, middle, and high school; the common thread of what my teachers would say to me went along the lines of "Steve, you'd be an straight-A student if you would just pay attention”. I loved daydreaming, especially during class. Looking out the window at the clouds passing by was a lot more interesting to me than what I was supposed to be learning in class. Daydreaming transitioned naturally to picture-taking. Throughout most of my adult life, I have been the picture-taker of the family. It must have been in my genes; because my dad and my grandparents too, were into photography. I am fortunate enough to have some of those pictures that were shot back in the early part of this past century. 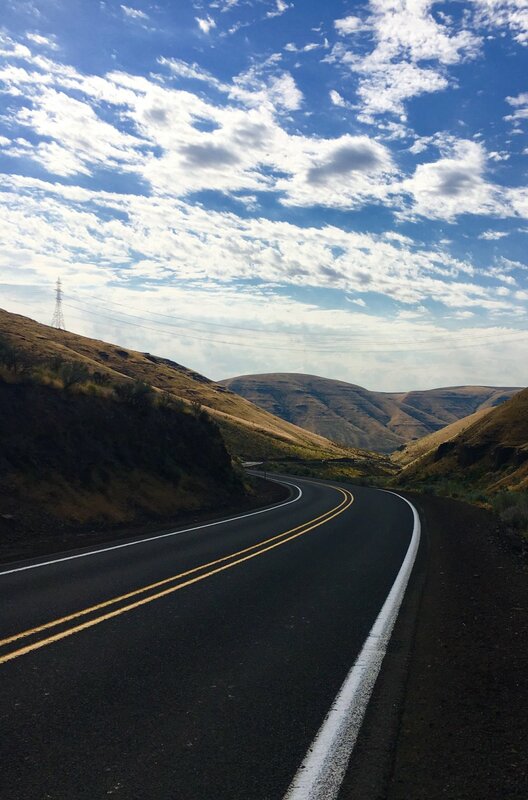 Last summer, I was lucky enough to have had the chance to ride and drive through some lesser-travelled roads of Oregon. Through my lens, I thought I would share a few of those trips with you. The Ferrari 458 is both a beauty and a beast. The sleek curves of its body and thunderous power of its engine are reminiscent of both starlet and stallion in their primes. While I have laid eyes on and auctioned off many a luxury car, a Ferrari always catches my attention. Its flawless lines and powerful purr make my head turn every time. This particular one, basking in the California sun at the auction last week, was no different. Even if you are not a car buff, you would notice a Ferrari driving down the street. It has a uniquely beautiful appearance and you cannot miss the sound. When your neighbor starts his Ferrari, the whole block knows it and we all want to go along for the ride. If you ever get the chance to take one for a spin, buckle up Buttercup! Sunny days are here again! Well, at least this weekend they were and I hate to waste a day inside when the sun is out. Saturday was the first that we have had a mild, sunny day in awhile. It was too nice of a day to not go on a quick ride, so I hopped on my 1983 Kawasaki GPZ 750. It was great to get her back on the road, but too nice to ride just the one bike. So I thought it was time to exercise my old 1979 Honda CBX 1100 too! It had actually been quite awhile since I had taken it out for a spin. What a blast from the past that was. Both bikes are not only different in style and vintage. They both have their own unique set of attributes; least of which is how each rides. The GPZ rides like a quarterhorse; while the CBX is a bull. The GPZ handles really well; it was designed to take corners. To me, it is the grandfather of the modern sport bike. Whereas, the CBX is a pure acceleration machine. It has a huge engine and the output can be described as too much too fast. Unlike the GPZ, it is a really heavy bike; so cannot turn or stop on a dime. Bottom line is the GPZ and the CBX are completely different bikes with completely different riding experiences. So depending on the day or my mood, both suit me just fine. My new year doesn't start on January 1st. It starts after I take down my Christmas tree. So 2018 started for me on the 4th this year. We spent the holidays here in Portland then headed north to Vancouver, Canada for New Year’s Eve. Getting to Seattle from Portland usually takes two and half hours; but the Friday after Christmas, it took us over four hours to crawl up the I-5. We pretty much hit every rush hour from Portland out. It didn’t help that it was pouring rain that afternoon and into the night. Though at the end of the road, we were rewarded with a bit of a getaway to our favorite hotel, The Sorrento. It’s a small boutique hotel built in 1909; it has a great vibe that the newly built ones just can't replicate. The morning after our stay, we started our trip onto Vancouver. With all the other holiday travelers on the road, we were slowed to a stop at the Canadian Border. It took us a nearly two hours to cross that day! Once in Vancouver, it was great to see all my friends and to celebrate with them over food, drink, and laughs. We've come to the final month of yet another year. I hope that everyone had an opportunity to enjoy 2017. Did it seem to you like the past twelve months got condensed into six? It sure seems like mine flashed past my rearview mirror in the blink of an eye. Though it was a real whirlwind, I really did enjoy my 2017. I had the chance to do some traveling, to ride my motorcycle lots, to reconnect with some of my old friends, and I even got an acting gig! I also could not have asked for a better group of people to work with either. This year; I was lucky enough to have gained some great new clients, while still continuing to work with some very long-standing customers. In 2018, we will be celebrating a decade-plus with many of our working partnerships. It is pretty incredible to have such loyal customers, especially in the ever-competitive arena of auctioneering. I hope everyone will get the chance to spend some quality time with family and friends, to enjoy some good cheer, and to hit the ground running in 2018. I look forward to seeing you all then. For now, signing off with a Happy Holidays to you all and a Merry Ho Ho! Thanks to my brother, Richard, for snapping this great shot of the beer wall in the back room at the Imperial Bottle Company on Alberta Street. Ali here... Instead of bikes and cars, real estate and fundraisers; we’re going to talk about beer this week! Portland has this great food truck, coffee shop, and wine scene; plus more beer and breweries than the average guy can keep up with. I’m going to share with you here, a few of our favorites. The Imperial Bottle Shop just opened its second location on Alberta Street this year. It has a selection of 300+ bottles of beer on the wall and cooler, and it offers fresh pours out of 28 taps! There’s even a couple of old-school arcade games for your playing pleasure. Breakside Brewery has a lot of everything going on. From award-winning IPAs to a pet project of barrel-aged sours, it has got something for every palate. These guys are pretty good in the kitchen too. We’ve enjoyed a great meal or two at both the Dekum and Slabtown locations. Pfriem has a classic line that perfectly suits the traditionalist. Included in its over two dozen classic offerings are a Pilsner, Pale Ales, a Mexican Lager, and a whole bunch of IPAs for good measure. Pfriem Family Brewers is in Hood River, about an hour drive out of Portland. With over 100 breweries in the Portland Metro area, it would be easy to find a couple of favorites of your own. Cheers to beer and more beer! 2017 marks 27 years that I have been an auctioneer. It is a very unusual line of work and I have had some very interesting opportunities. Of course; there were times when I felt discouraged, or I got passed up for a gig that I really wanted, and even been fired from one. I never did give up and sure glad that I didn't. It's not like I grew up thinking I would be an auctioneer when I was a little kid. It just kind of happened. October kicks off the fall fundraising season here at srdorsey auctioneering! 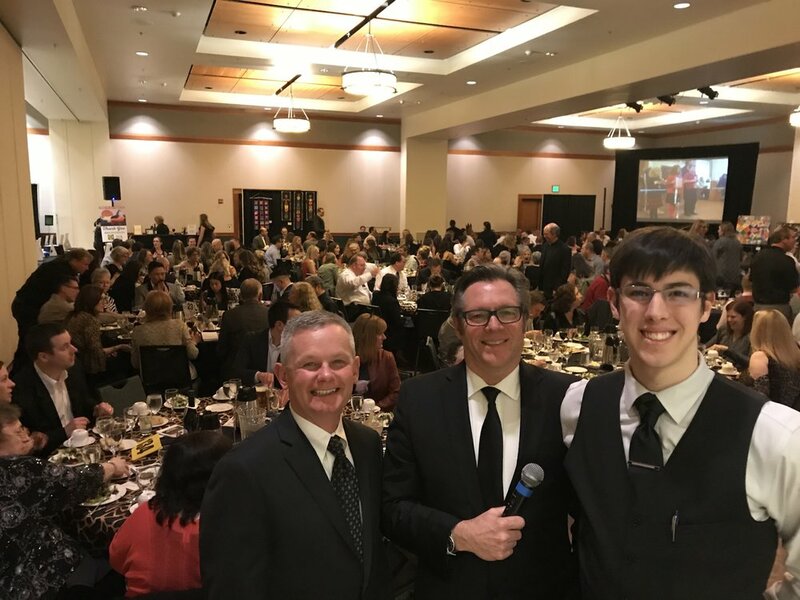 Instead of the bevy of beer and bratwurst that defines Oktoberfest, our month is chockerblock full of benefits and galas, special appeals and fundraising auctions. This year, we are back at the World of Speed Museum. We are working again with Chad Brown and his Soul River Foundation in Portland, then onto San Francisco for the Wild Salmon Center 25th anniversary celebration at the end of the month. We will likely raise over a million dollars at these three auctions alone. Very exciting stuff. On the car side of things; I worked a collector car auction with my old boss Mitch Silver, over the weekend. We'll be meeting up again in Southern California and Las Vegas. Check back in with us at the end of the month to see how we made out!